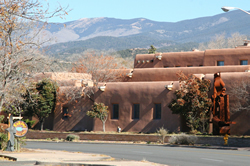 Santa Fe, New Mexico - Canyon Road area | Real Estate and Community Info. Santa Fe is well regarded as an art lovers’ paradise. Artists of all disciplines have flocked to Santa Fe for decades to be part of the city’s vibrant art culture. Canyon Road is the heart of Santa Fe’s thriving art district and features over 100 art galleries and studios. Located just east of Santa Fe Plaza, Canyon Road has the highest concentration of art galleries in the city, and it attracts a very steady flow of interest from international collectors, tourists, and locals. The Canyon Road Galleries showcase a wide array of contemporary, southwestern, and experimental art. Other galleries are dedicated to disciplines such as fine art photography and handcrafted jewelry. From the Native American art of galleries like the Adobe Gallery, to the contemporary and historic art of the Nedra Matteucci Galleries, Canyon Road will more than satisfy the pallet of any art enthusiast. The Santa Fe Plaza is the epicenter of the city. Santa Fe, true to “Law of the Indies,” town planning rule, is laid out around the central Plaza. Surrounded by tremendous architecture dating back to Spanish Colonial times, the Plaza consists of a central park lined with grass, trees, and benches, which add to the cultural scenery. Included in the park is an American Indian War Memorial monument, as well as a performing arts stage, where live music serves as the soundtrack for Santa Fe’s bustling nucleus. The plaza is also home to the Palace of the Governors, which is the oldest public building in the United States. Though Canyon Road is no doubt famous for the plethora of art galleries who call the street home, several innovative and award-winning restaurants also welcome Canyon Road travelers. The Compound Restaurant and Chef Mark Kiffin’s signature brand of southwestern cuisine is one of Canyon Road’s premier culinary destinations. Geronimo is another of Canyon Road’s phenomenal dining possibilities. Chef Eric DeStefano’s “Global French-Asian” menu has made Geronimo one of Santa Fe’s elite dining experiences. For those longing for a Santa Fe original, look no further than the El Farol, the city’s oldest restaurant and cantina. El Farol incorporates live entertainment and breath-taking art into a dining adventure that earned the nickname “The Heartbeat of Santa Fe.” Across the street from El Farol is another culinary gem, The Teahouse, which (surprise!) specializes in a plethora of teas and many affordable, delicious lunch and dinner choices. Many other dining options await travelers and locals along Canyon road. From vegetarian to Thai to Italian fare, Canyon Road’s dining choices each display their own distinctive traits just waiting to be explored. Located right across Canyon Road from Geronimo is one of the districts finest shopping attractions: Desert Son features fine handcrafted designs that exemplify Santa Fe Style. Head west on Canyon Road and many other shopping destinations abound, including another example of handcrafted Santa Fe Style. Nathalie offers jewelry and accessories that embody the true spirit of the southwestern culture. Canyon Road Real Estate is always some of the most treasured in Santa Fe. A fusion of awe-inspiring architecture and artistic passion come together in each of the Canyon Road Estates. Whether you are looking for a fully restored Adobe-Style with a view of the Rio Santa Fe or your favor a Glorious European Style with the best views in Santa Fe, Canyon Road living is the perfect mix of luxury and convenience.